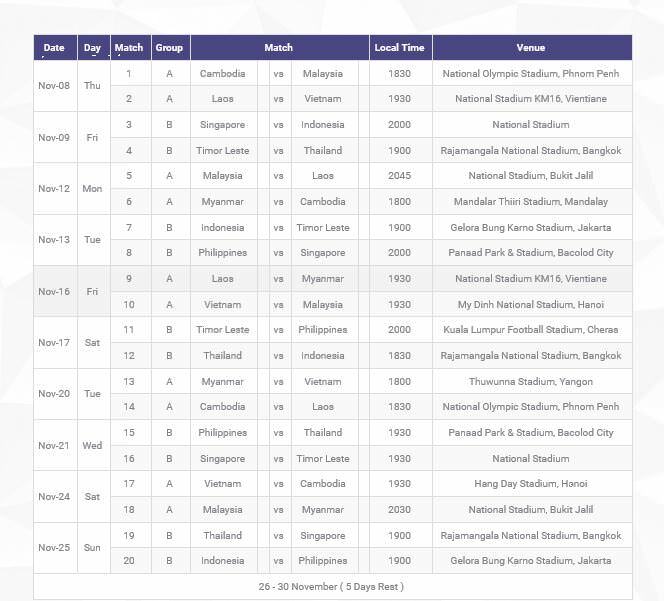 The final round of the Asian Football Federation Suzuki Cup 2018 will kick off tomorrow, 8 November, and will take place at 12 different stadiums all over Southeast Asia. The competition wraps up with the Cup Final on 15 December. The competition opens in Phnom Penh at the National Olympic Stadium at 18:30 local time with Cambodia vs Malaysia. Group A: Vietnam, Malaysia, Myanmar, Cambodia and Laos. Group B: Thailand, Indonesia, Philippines, Singapore, Timor Leste. 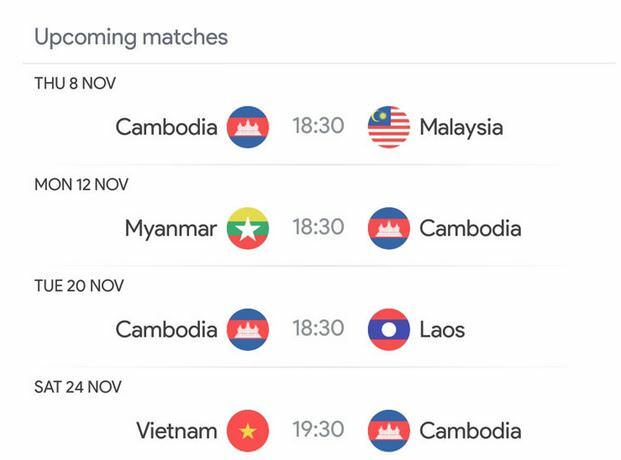 looking forward to the Cambodia vs. Malaysia game tomorrow! After Malaysia’s last friendly match against the Maldives before the 2018 AFF Suzuki Cup 2018, head coach Tan Cheng Hoe finalised his 23-man squad for the biennial regional football competition. From the updated list of players released by the Football Association of Malaysia (FAM), Tan Cheng Hoe has decided to drop three players Azrif Nasrulhaq Badrul Hisham (Defender, JDT), Nor Azam Abdul Azih (Midfielder, Pahang) and Azzizan Nordin (Midfielder, Sabah). 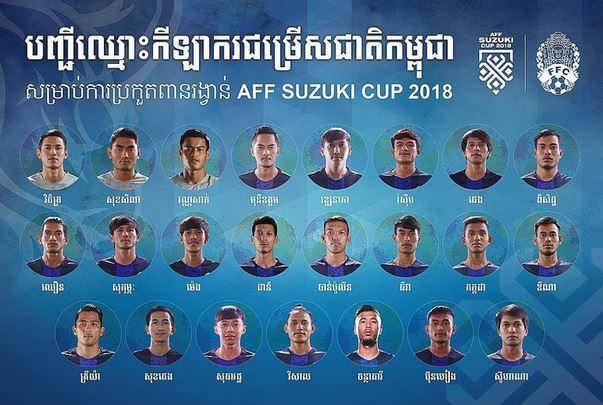 The Asean Football Federation (AFF) Suzuki Cup, the region’s premier festival of football, gets underway tonight with Cambodia hosting Malaysia for a tasty competition opener which is sure to captivate fans at Phnom Penh’s Olympic Stadium. Felix Gonzalez Dalmas, head coach of the national football team, speaking at yesterday’s press conference here in Phnom Penh, said that his team had been making good progress and were learning how the new coaching team expected them to play. Dalmas said he learned a lot from the clash with Malaysia in their international friendly encounter last September, and he expected the team to be able to not repeat mistakes. “It was a good game and we lost, he said of their September defeat to the Malaysians “But we learned a lot from the game. 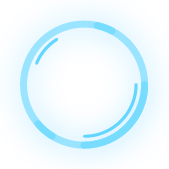 We saw our mistake and we tried to fix them,” he said. Fans expecting to see Japanese star Keisuke Honda on the Cambodia bench again when they open their 2018 AFF Championship campaign, against Malaysia, will be disappointed to know that he will not be in Phnom Penh on Thursday. 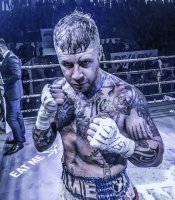 The Angkor Warriors manager, who at the same time is still playing club football for Melbourne Victory in the A-League, has been playing an instrumental role for the club, and is expected to line-up for Victory next weekend. In addition to this, the Japanese does not have the necessary coaching badges required to lead a national team as its head coach. Instead, Argentinian head coach Félix González will lead Cambodia when they face Malaysia. Only last September, Honda led Cambodia against Malaysia in a friendly match at the Cambodian Olympic Stadium, their first game since the pair's appointment. The match ended in a 3-1 win to the Harimau Malaya. Speaking in the press conference on Wednesday, the 30-year old trainer explained Honda's absence. "No, he won't be here for this particular game. But he's still communicating with us, he still joins our meetings and knows what's going on. It's different not having him for sure, but I don't think it will affect our chances. "Hopefully he'll get to join us in the later games in the group stage," he said. 9 November 2018: Severe disappointment in Phnom Penh last night at the opening match of the AFF Suzuki Cup, as the Cambodian team failed to convert their opportunities after Malaysia scored.